Eulogy to Ivy Green written by her daughter Sheila. Ivy was the Great Great Granddaughter of Ann Mort from Leigh and was also my dear sweet mother who I miss so much. I thought I would like to share her eulogy with the Mortfamily.net website as yet one other member of the living who has just become an ancestor. Her funeral is this Friday 9th January 2009. Ivy Green was a remarkable person who at the age of 87 lived a full and long life. 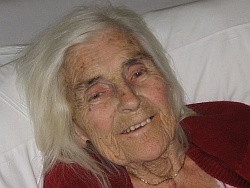 She passed away peacefully at Wigan Infirmary on a snowy New Years Eve surrounded by her family. Ivy died of natural causes following 2 months of illness in which she put up a fight she was too tired to win. It is the desire of her family that today should not be a day of mourning for her passing, but a day of celebration for her life. She was a loving and caring mother, wife, nana, neighbour, work colleague and friend. Born as Ivy Thomason in the spring of 1921 in Atherton, she was until recently one of the few remaining people from a time long past. She lived in an era during which electric lights replaced gas lamps. She gave birth to her 1st child during the 2nd world war. She purchased the 1st black and white TV in her neighbourhood and on it she watched men land on the moon. She lived through an amazing time in history and was one of the last of her generation. She was raised in a humble working class family, who despite adversity and hardship also valued intelligence, ambition and most of all – love. Ivy’s family worked in the cotton mills and coal mines of Lancashire, and most of her uncles lost their lives in the 1st world war. However her family were survivors who loved their children and worked hard to achieve a better, richer and healthier life. It is a legacy remembered with pride and gratitude from those of her family who now benefit from these past sacrifices. Ivy diced with death many times in childhood. Falling head first into a barrel of water as a toddler and being pulled out by her clogs, blue in the face and no longer breathing. Life was tough on the young Ivy Thomason and she had the scars to prove it. However this in turn gave her a fighting spirit and resilience that never left her, even in the final days of her life. In the depression of the 1920’s a 4 year old girl waved goodbye to her father Benjamin on the dockside of Liverpool as he sailed to America in search of work. She was never to see her father again and this was a source of great pain and hardship to the family he left behind. However the young Ivy was forever a warrior and a survivor. Ivy had a brother Victor and a sister Vera. Victor was a weak child with several disabilities and was often taunted and bullied by those bigger and stronger. Ivy was his protective and loving sister who would square up to those who terrorised her sickly brother and would happily pick a fight with anyone who dared to torment him. She would knock on the doors of those who bullied him and confront them directly, often asking them to step outside for a fight. From a young age she was taught to be caring and yet hard at the same time. Ivy was always loving to those she loved, yet could be bluntly honest, it if at times a little too honest to those who crossed her. Ivy would say it as it was, even if the words were not subtle. She did not suffer fools gladly and as a true Lancashire Lass called a spade a spade. Few people have to bury their only brother and sister whilst still young themselves, however Vera her baby sister died at only 6 months of age. Her brother Victor passed away at just 21 years old from throat cancer. Ivy was left behind as the only child of her mother Florrie. Yet Ivy remembered her childhood with warmth and love and disregarded the difficult times as mere challenges. By the age of 14 she was herself working long hours in a cotton mill. The cotton dust combined with Rheumatic fever left Ivy with a heart murmur and a chest problem from a young age. However Ivy did not succumb to these physical setbacks and went on to live a long life. Her heart was not strong and yet, she had the strongest of hearts. 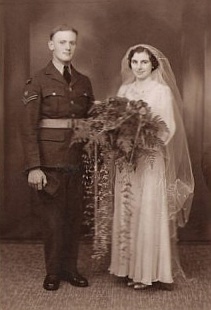 She married her first husband David Norris in 1939 at St James Church, Daisy Hill. David was 21 and Ivy was just 18. Their first born child was also called David, however she spent D Day (6th June 1944) having revolutionary new surgery so she could have other children. Many of her present descendants totally owe their lives to her determination in overcoming these medical problems. Quite simply, Ivy would do whatever it took. She had many jobs in life, from landlady of the nearby Shepherds Inn at Lowton, to a seamstress and then a stock controller at the Vulcan in Newton Le Willows. However, with yet another tragic twist of fate she lost her husband David after 23 years of marriage, when he was just 44 years old. As a widower with 4 children, Ivy was once again thrown into survival mode. She met her present husband Frank Green a few years later and they settled down to a pleasant life in Newton Le Willows. Ivy Norris became Ivy Green. As well as burying her own brother, sister and husband at a young age, Ivy had other crosses to bear. Few parents would want to outlive their own children, and yet Ivy had to suffer the loss of her eldest son David in tragic circumstances. Like his father before him, he was only in his early forties. A year later, she lost her Grandson John in a motorbike accident when he was just 21. She also lost Elizabeth her first born grandchild, from cancer. Elizabeth was also in her early forties and Ivy struggled to recover from this grief. Ivy also lost a great grandchild from a cot death. Living through so many personal tragedies, Ivy was hard and yet soft at the same time. She taught us that as life ends (sometimes too soon and too young) that life also goes on and we can survive, recover and heal. Ivy was a woman with great religious faith who prayed every day, and found enormous comfort from her spiritual beliefs. She always walked with Jesus in her heart. A kind and caring person, she prayed for others more so than herself. On a brighter note, for a poor Atherton girl - Ivy did travel the globe and lived a most amazing colourful life. Her sons lived in California and Australia respectively and Ivy travelled to both places on many occasions. Sorting through old family photographs, it seemed that Ivy could usually be found standing under a palm tree, at a BBQ, on a mountain in California, at a party, in a vineyard or standing on the steps of Sydney Opera house. Ivy was well travelled and in days of better health, enjoyed the good times to the full. In this last week of mourning, her family have found comfort in recalling many of her escapades and antics which reflected her sense of daring, fun, humour and adventure. There was never a dull moment with Ivy Green. She may be lost to the world right now, but leaves behind many amazing memories. Ivy was a kind and caring woman who was much loved. She just became old and everything started to switch off, one by one, bit by bit. It was time for her to leave for new horizons and search for new adventures. She was blessed in that she did not leave this world alone. She was surrounded by her family and a great deal of love as she gasped her last breath. Outside the hospital window it started to snow and the landscape was like a Christmas Card. She missed seeing 2009 by just over 10 hours. She made sure that she would never be forgotten, choosing New Years Eve as her grand exit. She is with her other family now and it is their turn to surround her in love…..but for those left behind – she is a wife, a mother, a Nana, a Great Grandma, a caring neighbour and a good friend who will always be missed and never forgotten.